I really enjoyed Persona 4: Dancing All Night. And so did Fahey. But as fun as it was on the Vita, there’s something special about playing it on a giant arcade cabinet. 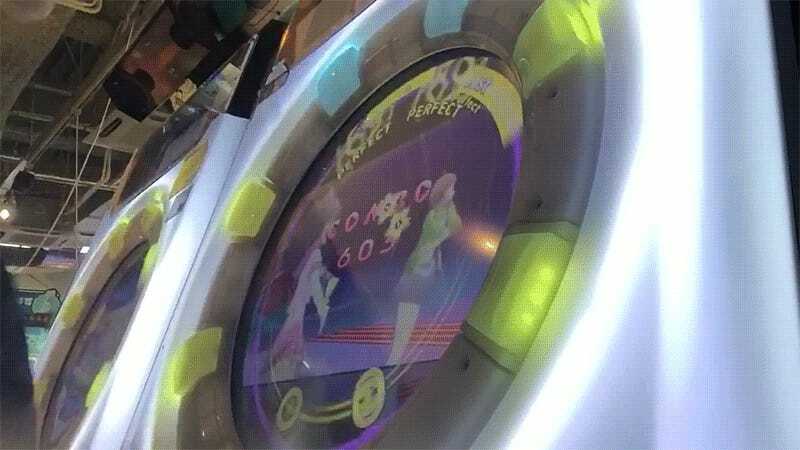 When playing Persona 4: Dancing All Night a few months back, something struck me as very familiar—namely the interface. After all, if you add two buttons and an additional touch screen mechanic, it would look and play almost exactly like Sega’s arcade game MaiMai. And being that Atlus is now owned by Sega, it makes perfect sense to see that some of the Persona 4: Dancing All Night songs have made the jump to MaiMai. These four songs are Pursuing my True Self, Time To Make History (AKIRA YAMAOKA Remix), Specialist (“Never More” ver. ), and Signs Of Love (“Never More” ver.). They play exactly as you would expect—up to and including the Persona 4 characters dancing in the background. Despite the actual prompts being a different shape, playing Dancing All Night on the Vita prepared me well for playing at the arcade on expert—though of course the players in the linked videos blow me completely out of the water. Regardless, I had a blast. Interestingly enough, MaiMai isn’t the only game to get these Persona 4 tracks. Sega’s new hit music arcade, CHUNITHM, has them as well. And, let me tell you, playing those songs on that game—with its keyboard and several motion sensors tracking your hand movements—is a ton of fun as well.